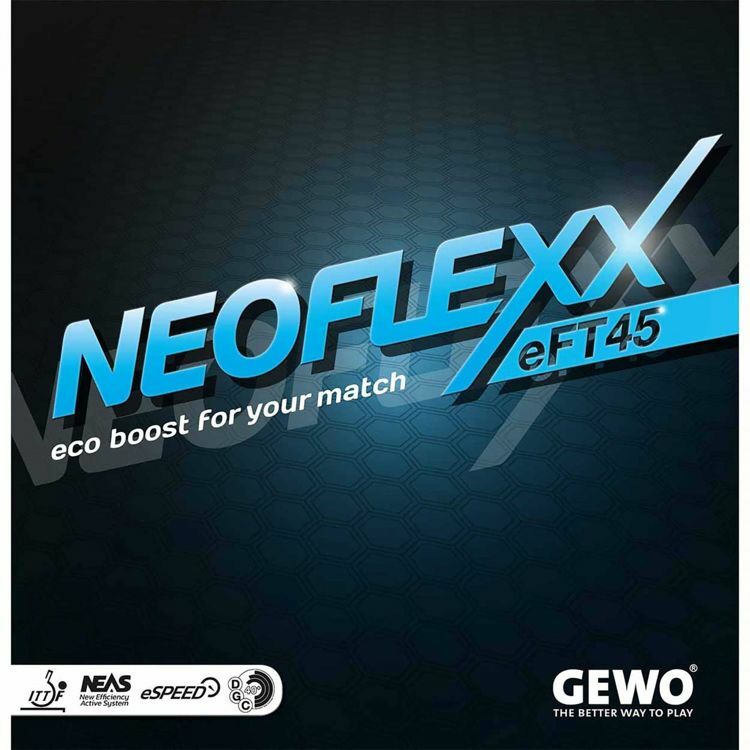 GEWO Neoflexx eFT 45 comes with a very grippy, medium hardness DGC40+ top rubber sheet providing you with great grip and dynamics thanks to "Dynamic-Grip-Concept" as well as all that you need for modern table tennis. In order to really perform at your very best, you will have to find the right rubber first. Fortunately, there is a simple choice for optimum performance - GEWO Neoflexx eFT. The new standard package solution is the perfect combination of versatility, playability and great forgiveness. Eco boost (eTec) is at the focus of this rubber series. eTec guarantees accurate placement, fun and control in all situations - available variants: eFt 48, eFT 45 and FT40. One thing about rubbers became very clear in the many product meetings and test series involving our GEWO coach team: It is not the fastest rubber that makes a champion. "It is as simple as that: In order to succeed, you just need a rubber you can rely on in any situation to win more points than your opponent". This rubber series provides you with everything you need at an excellent cost/performance ratio. This economic Tensor rubber features the grippy and transparent DGC40+ surface which has already proved a great success and the new NEAS sponge. GEWO Neoflexx eFT 45 comes with a very grippy, medium hardness DGC40+ top rubber sheet providing you with great grip and dynamics thanks to "Dynamic-Grip-Concept" as well as all that you need for modern table (high trajectory, extraordinary ball rotation and a wide range of spin and stroke variations). The eco-Boost package offers a perfect spin/speed ratio, high versatility and ensures, thanks to the DGC40+ top rubber sheet, high reliability and consistent playing characteristics.
.	eco(nomic) boost has high spin ratings, absorbs arriving spin, thus offering great reliability and control.
. Despite the 45.0° NEAS sponge this rubber provides you with all the feel and control you need.
. Perfect for players of all classes relying on offensive all-round play! eSpeed / eSpin Technology: "eco(nomic) boost for your match" is the motto of this rubber series. This rubber generation is based on a perfect combination of a newly developed sponge with a grippy surface and new pips arrangement. The harder rubbers (45° and 48°) focus on speed (eSpeed) - the softer rubber (40°) on spin. eSpeed / eSpin - perform at your best. GEWO Neoflexx eFT - expect more! NEAS: "New Efficiency Active System" - unerringly accurate. The newly developed NEAS sponge provides for sufficient speed in all offensive strokes - however, it's control that this series primarily focuses on. Suitable for players of all classes. DGC40+: The proven DGC40+ "Dynamic Grip Concept" guarantees uniform, reliable coupling of the ball when it hits the bat, its new surface texture prevents the (poly)ball from "slipping" and energy losses when the ball leaves the rubber. The surface was specially developed for and adjusted to the new requirements of the poly ball.